Only 3 grocery stores exist in Wards 7 and 8 (of 49 in the District) serving over 150,000 residents. Through the Grocery Access Program, Lyft is committed to reducing the time, transportation barriers and financial burden as hundreds of families plan their shopping trips to select grocery providers. Wards 7 and 8 in Washington, DC are the most underserved by grocery stores with 81% of residents living in a food desert. Residents in these areas often have to travel further to access a full-service grocery store, which increases transportation costs and often squeezes a household’s already limited budget. Moreover, lack of access to the foods necessary for a healthy and balanced diet can lead to poor health outcomes. Lyft & Martha’s Table monitor subsidy usage and participant experience. Through the leadership of the Anacostia Business Improvement District, Lyft is a founding member of the DC Food Access Consortium. The consortium is comprised of public and private organizations dedicated to improving health outcomes for the District’s residents starting with bridging the grocery gap for Wards 7 and 8 families. If you are interested in learning more about the Food Access Consortium, contact Kristina Noell at kristina@anacostiabid.org. A. Lyft was founded in 2012 by Logan Green and John Zimmer to improve people’s lives with the world’s best transportation, and is available to 95 percent of the United States population as well as select cities in Canada. Lyft is committed to effecting positive change for our cities by offsetting carbon emissions from all rides, and by promoting transportation equity through shared rides, bikeshare systems, electric scooters, and public transit partnerships. Q. How do families qualify to receive $2.50 Lyft Shared rides to Safeway, Giant, and Martha’s Table? A. To qualify, one must have a child enrolled at one of the seven participating elementary schools or Martha’s Table programming and attend an in-person orientation with Martha’s Table and Lyft. Three short surveys during the six-month program are also required. The surveys will ask about grocery shopping habits before the ride credits are received, in the middle of the program, and at the end. Q. Which schools are part of the pilot? A. Currently, 7 elementary schools and Martha's Table are eligible to participate. Check back in January 2019 as additional schools may be added soon. Q. How many families will participate in this program? A. Initially, up to 500 families will be invited to participate in the first phase of the program between January 1, 2019-June 30, 2019. Q. Who is Martha’s Table? A. For nearly 40 years, Martha’s Table has worked to support strong children, strong families, and strong communities by increasing access to quality education programs, healthy food, and family supports. Q. Why is Lyft partnering with Martha’s Table? A. For Lyft to meaningfully engage in DC’s food ecosystem, we believe it must be done in partnership with the community and leaders like Martha’s Table. Joyful Foods Markets held at Wards 7 and 8 schools are a natural entry point to reach families already engaged in healthy food and nutrition programs. 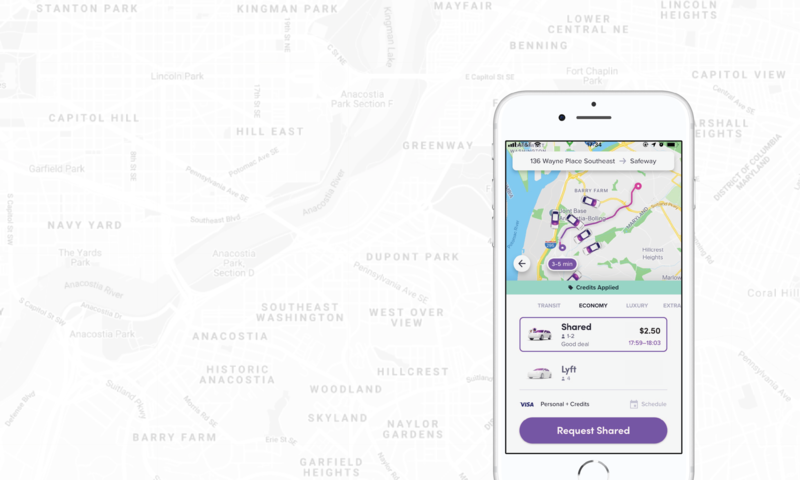 As such, providing Lyft transportation subsidies becomes an extension of the services already offered by Martha’s Table, rather than a standalone program. This can lead to more effective, measurable, and scalable impact. Q. What is a Lyft Shared ride? A. A Shared ride connects you with other riders along your route. When you're ready to go. Since there may be other riders depending on you, drivers will not wait more than one minute at your pickup location. It’s important that you’re waiting outside of your location before your ride arrives to avoid it leaving without you! For parties of 1 or 2. The program allows up to two family members. See requirements for children under 8 years of age. Q. What is a flat fare ride? A. A flat fare ride means a passenger will always pay one price—in this case $2.50—no matter how much the total ride ends up costing. Q. Can these $2.50 rides be used to go other places? A. No. The discount only applies to the locations specified.